As the world pioneer in certified organic bee farming, Y.S. has the true knowledge of quality differences of floral sources and regions. They have searched the world and traveled thousands of miles to find the perfect isolated, untouched areas where nature is abundant with wildflowers that flourish in the undisturbed frontier wilderness. 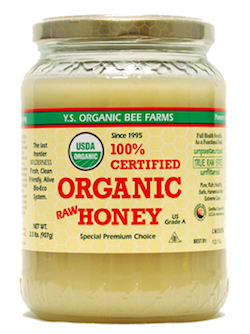 This organic raw honey is harvested with extreme care, 100% pure, natural, unpasteurized and unfiltered, fresh from thriving beehives. The results produce a superior, energy packed honey with the highest possible levels of live enzymes, vitamins, minerals, antioxidants and beneficial agents as a functional whole food. This organic commitment with lifetime dedication brings you nature's very best, a highly selective ultimate choice quality organic honey. Enjoy nature's gift full of delicate flavors and rich delightful taste. Suggested use: Use as a functional food with full wellness benefits. Even when kept indoors, our raw honey changes consistency with outside temperature; proof of its raw natural state. Caution: Do not feed honey to infants under one year of age.